A clean balance can help you produce accurate results and promote longer equipment life. But it can also protect you from exposure. Discover the 8 steps to a clean balance—as well as 5 tips to help keep it that way—in a free white paper from METTLER TOLEDO. “8 Steps to a Clean Balance - and 5 Solutions to Keep It Clean” covers information such as how often to clean a balance, how to handle balance components, and which cleaning agents to use. Greifensee, Switzerland—December 1, 2018—If you work in a lab, then you know that clean balances can help minimize cross-contamination risk, promote accuracy and reduce equipment failure. However, clean balances also help to protect technician health. The good news is that cleaning a balance and keeping it clean can be quick and easy—as long as you know the steps to take. METTLER TOLEDO’s white paper “8 Steps to a Clean Balance—and 5 Solutions to Keep It Clean” covers information such as how often to clean a balance, how to handle balance components, and which cleaning agents to use. Using the mildest agents possible based on weighed substances and balance design helps to further limit operator exposure and reduce the risk of undesirable cross-reactions or residues. The paper also provides tips to adjust workflows in ways that help keep balances from becoming dirty in the first place. This includes the best methods for protecting the balance when it is in use as well as when it is in storage. 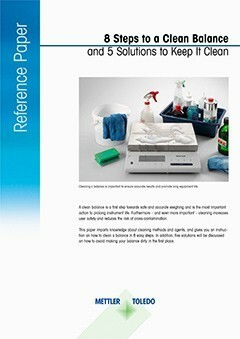 Easy-to-implement sample-preparation solutions that eliminate spills and dust are also reviewed. Taken as a whole, these suggestions help you maintain accuracy and workplace safety long-term. Download your copy of “8 Steps to a Clean Balance—and 5 Solutions to Keep It Clean” as a next-step towards improving safety in your lab today. METTLER TOLEDO is a leading global supplier of precision instruments and services. The Company is the world’s largest manufacturer and marketer of weighing instruments for use in laboratory, industrial and food retailing applications. METTLER TOLEDO also holds top-three market positions in several related analytical instruments and is a leading provider of automated chemistry systems used in drug and chemical compound discovery and development. In addition, the Company is the world’s largest manufacturer and marketer of metal detection and other end-of-line inspection systems used in production and packaging and holds a leading position in certain process analytics applications. Additional information about METTLER TOLEDO can be found at www.mt.com.